As you move your clocks forward this evening or tomorrow morning you may also want to think about replacing smoke detector batteries. The shift to daylight savings time or standard time are always good points in the year to replace smoke detector batteries and to trigger other periodic home maintenance checks such as changing air filters, batteries in wall thermostats, and even water filters. A leaking mortar shower pan can cost thousands of dollars of damage to your home and can be extremely expensive to repair. The best advice I can give you is to install a mortar shower pan properly the first time, versus having to think about repairing a leaking shower pan later. To prevent from having to repair a leaking shower pan I highly suggest you take a look at my “Shower Pan Membrane Liner Installation Ebook”. This Ebook provides detailed instructions, along with dozens of instructional pictures, on how to properly install a mortar shower pan. 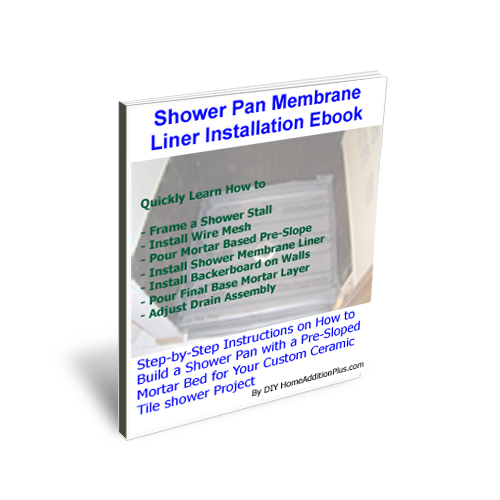 By following the instructions in this ebook you will build a leak free shower pan. If you do find yourself in a position of repairing a leaking shower pan, the first step is to remove the shower floor tiles. You’ll also need to remove the wall tiles from the bottom 12 inches of the interior shower walls. After removing the shower floor and wall tiles, vacuum up all of the rubble and dust. Then, using a cold chisel and large hammer, break up the mortar shower pan. In the process remove the existing shower pan liner. If there was a pre-slope mortar layer below the mortar shower pan, which there should be, remove that as well, again using the cold chisel and hammer. Note: If you find that the pre-slope has a good pitch to the drain, using a spirit level, and it has a smooth surface then you can forgo having to remove the pre-slope mortar layer. After cleaning up the shower floor area with a broom and vacuum, you can then begin the process of installing a leak free mortar shower pan. If there was no pre-slope mortar layer, or you had to remove the existing one, pour the pre-slope mortar layer making sure you have a proper pitch to the drain. Next install the flexible shower pan membrane liner. Finally, pour the final base mortar layer over the membrane liner. 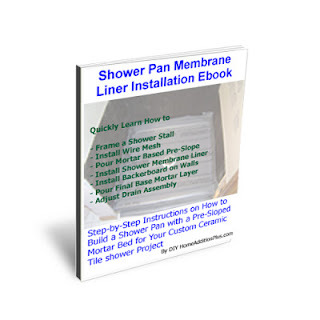 Again, I highly recommend buying my “Shower Pan Membrane Liner Installation Ebook” to learn all the specifics of how to install the mortar shower pan properly. After the base mortar layer has cured you can then retile the shower floor and surrounding shower walls to complete the shower pan leak repair.